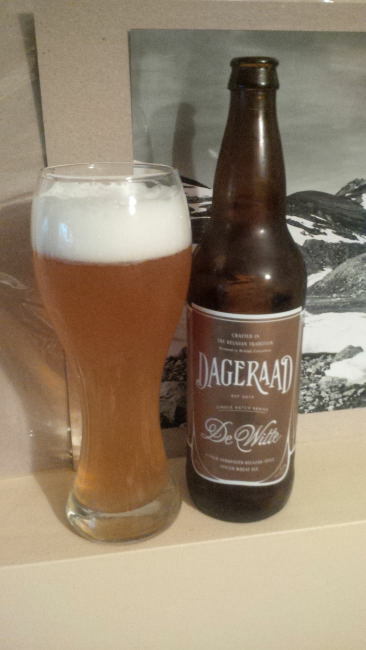 From Dageraad Brewing out of Burnaby BC comes their “De Witte” a sour fermented Belgian Witbier. The beer pours a cloudy golden yellow with a white head. The aroma consists of citrus and orange peel up front with bready wheat malts, coriander and other spices and a mild sour funkiness. The flavour is of bready wheat, orange peel, citrus, coriander, spices and a mild sourness from lactobacillus. The alcohol content comes in at 5.2%. I do not remember having very many sour Wit’s but this is a really integrating beer. It takes a good summer style ale and gives it just that much more intriguing! Commercial Description: De Witte is a flavourful summer beer brewed in the tradition of the while ales of the Flemish Brabant. Made with malted and unmalted wheat, seasoned with orange peel and coriander and fermented with Belgian yeast and lactobacillus. De Witte is complex on the palate, with a refreshing, tart finish. This entry was posted in Wheat Ale and tagged bc, belgian style, belgian witbier, bready, bready malt, bready malts, Burnaby, canada, citrus, coriander, dageraad brewing, de witte, lactobacillus, malt, malty, mild sour, mild sourness, orange peel, sour, sour fermented, sour fermented belgian witbier, sourness, spices, wheat, witbier. Nice, hoping to try this one soon. Glad to have a unique brewery like Dageraad in town. It’s so different than any wit I have had. I love when breweries experiment and play!